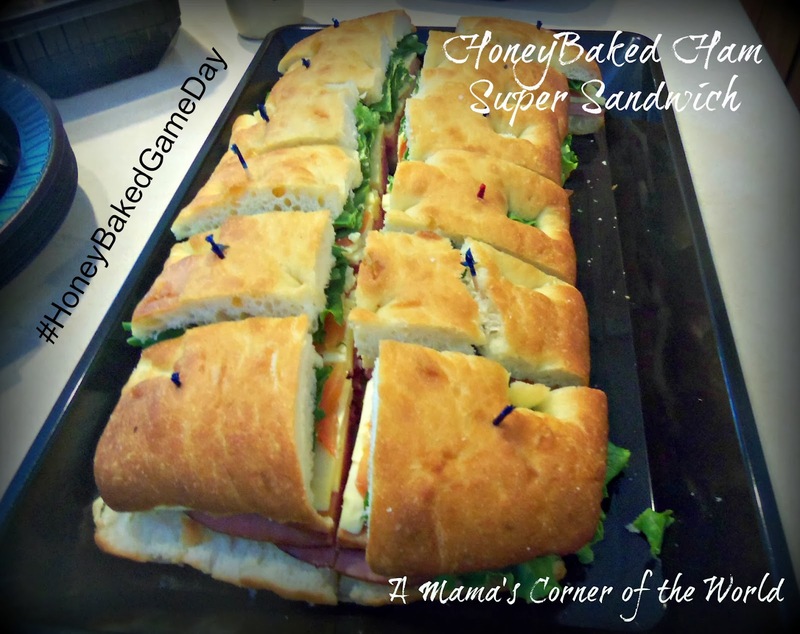 This post is brought to you by HoneyBaked Ham as part of their #HoneyBakedGameDay campaign. All opinions and experiences are our own. It's almost time for the Super Bowl--and, if you are like many of us, hosting an annual Super Bowl party or gathering is rapidly moving its way up your to-do list. It's time to plan, shop, prepare and serve a buffet of food! Are you ready? We usually find a tip or two to share around Super Bowl time every year. Last year, we shared a few of our favorite dip recipes that always find their way onto our party menu. This year--we had the opportunity to give HoneyBakedforYou, the catering service offered by The Honeybaked Ham Co., a try--and we even have a $25 gift certificate to share with one of our readers! You could use some help with your Super Bowl party, right? Have you tried HoneyBakedForYou.com? Many of us have probably ordered (or have been served) a honeybaked ham for Easter or Christmas. I didn't know that the company also offers a quick and easy catering and party planning menu too! 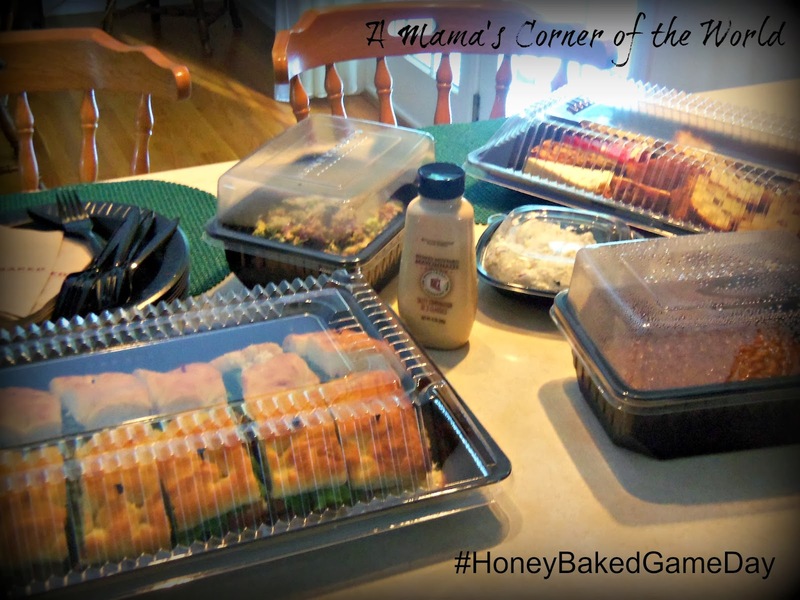 I have used catering services from local restaurants for parts of my party menu in the past--so how did HoneyBakedForYou stand up to the test for our latest game day gathering? Ordering at HoneyBakedForYou.com is almost too easy. While you can certainly phone into the HoneyBaked Ham store and place your catering order with a live person--I found the online ordering extremely user friendly. All of the serving sizes are listed on the various trays and side dishes--and they were really true to those estimates. I was able to read through all of the product descriptions and easily placed my order for a small party of 10 in no time online. The HoneyBaked Ham pick up process was quick and easy. I am something of a worrier--especially when I'm hosting a party! My order was ready on time--and it even included serving utensils, plates, cutlery, and napkins for 10 (a little detail that I completely forgot to note when I placed my order). The trays for my order were packed into a sturdy box with handles for carrying and a large bag held the side dish containers. How was the food from HoneyBakedforYou? Let me show you--we ordered an assortment of items from the store for our gathering! We chose a medium sized Super Sandwich--and it was plenty for our party! It was loaded with thick slices of HoneyBaked ham and cheese along with lettuce and tomato on even thicker slices of rustic pan bread. The younger girls (and even the ladies) found it a little tough to take a lady-like bite of these "super-sized" sandwich slices! These sandwiches are also available in roast beef or turkey too--and our girls have already put in a request for roast beef in the future. 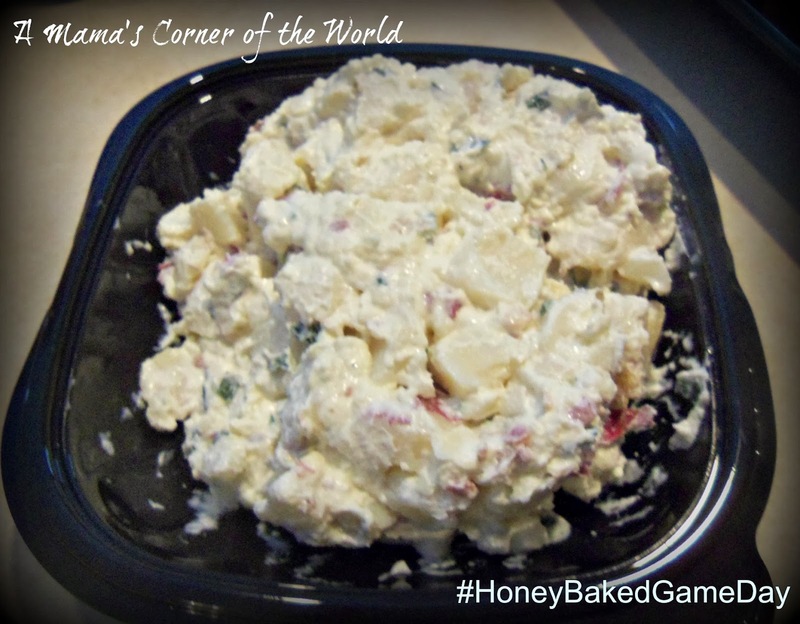 The HoneyBaked Ham Loaded Baked Potato Salad was a huge hit with everyone--even those who aren't always fans of the dish. 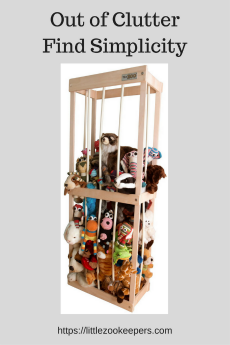 I have a feeling I'll be ordering this more often for gatherings--it is a lot easier than making my homemade version! Both the Broccoli Bliss salad and the Baked Beans were well received. One of the little ones who never eats baked beans actually ate these! The dessert sampler was wonderful! 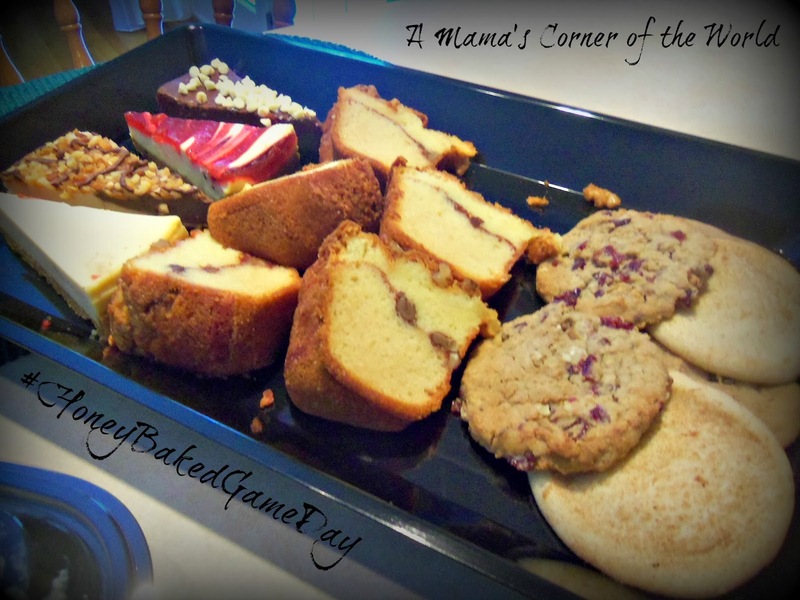 The sampler tray held four types of cheesecake, three types of cookies and thick slices of cinnamon coffee cake. It was so nice to offer so many dessert options without having tons of diet-blowing leftovers after the party! In all honesty--every item was a hit with our guests! I would certainly place another catering order with HoneyBaked Ham. Planning and ordering the menu was so easy--the food was a hit with the group--and I wasn't stuck in the kitchen while everyone else was enjoying the day. 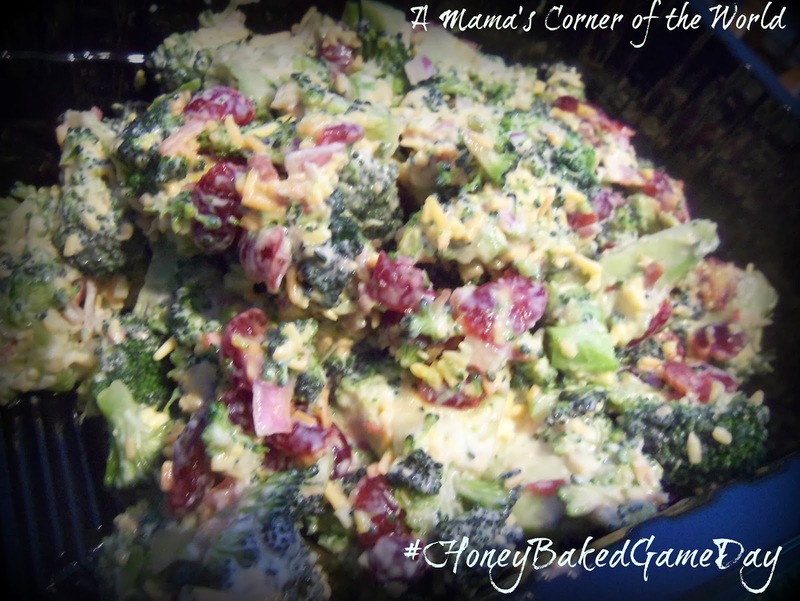 Enter to Win a $25 HoneyBaked Ham Gift Certificate! Are you planning a SuperBowl Party--or could you use a hand with an upcoming family gathering or event that you are hosting? We would love for you to try HoneyBakedforYou.com! Fill out the entry form below to enter to win a $25 HoneyBaked Ham Gift Certificate! 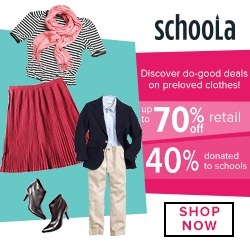 The contest ends soon--so hurry and enter via the Rafflecopter entry form today! Check out these limited time HoneyBaked Ham offers too! Disclosure: This giveaway is scheduled to end on Monday, 1/27/14, at 12am so that we can ship our winner the gift card as soon as possible--maybe even in time to use for a Super Bowl Party!! We cannot guarantee that the winner will receive the gift certificate in time for the Super Bowl--but, we'll try! Expect an email by 9am 1/27/14 if you are the winner--as we'll need additional information to mail the prize! 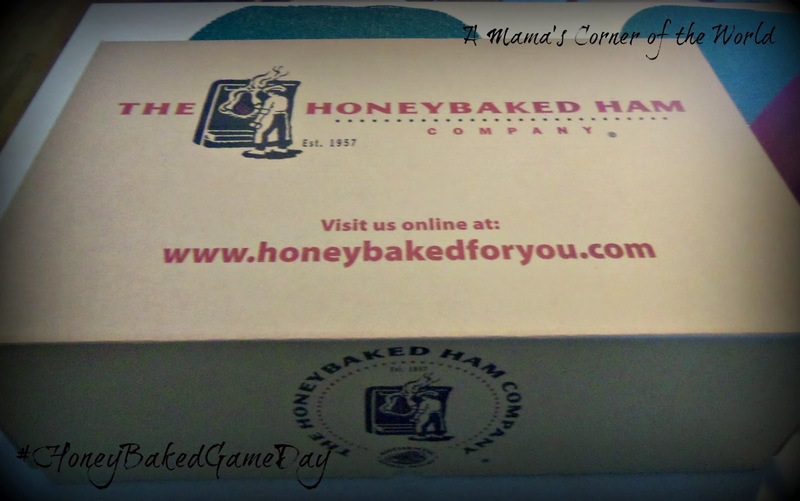 We received a gift certificate from HoneyBaked Ham to use toward our party menu. We received no other compensation and all opinions and experiences are our own. My favorite food on our SuperBowl party / game day menu is boneless chicken wings. My favorite food on our Superbowl party or game day menu is pizza and hot chicken wings. Chili tasting! friends bring over crock pots of different kinds of chili fro game day and we all go around tasting, great when it's so cold outside! 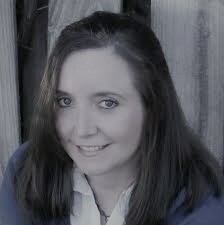 Elizabeth miller - My favorite game day food is wings. My favorite food on our Superbowl party menu is pizza and hot chicken wings. My favorite is pizza with chips and guacamole. I'd have to say spinach and artichoke dip! Yum! But since someone else already said that, I'll say a fruit tray with maybe chocolate covered strawberries! We like sandwiches made with honey baked ham, along with chips and dip and soda. Pizza is on our super bowl menu. We always serve Runzas, a sort of hamburger, cabbage sandwich. They are so good. Potato skins and Chicken wings will Definately be favored by most. I love submarines on gameday! Or chilli! Artichoke dip with chips and crackers. I like chicken wings and pizza. Corn Dog Casserole is everyone's favorite. I always do chocolate covered strawberries and pipe white chocolate football laces on them! Super cute and SUPER yum!! My wife makes these awesome bacon wrapped little hotdog wienie things! They're awesome! I love pizza and wings. Buffalo Chicken Crescent Rolls and football brownies! Thank you so much for this chance! My favorite is pulled pork sandwiches. Guacamole & cheese nachos are my favorite! I gotta go with the hot wings and ranch dressing. My favorite is chicken wings, so many flavors, such a small stomach! we have a layered taco dip that everyone begs for, for snacking. But HAM..oh boy a honey baked ham for sandwiches? Heaven! We make dip every year..I am undecided what the menu is going to be this year. I really like Italian hoagies. My favorite food on game day is guacamole and chips its the best! I like hot wings and potato salad. I love honey bbq wings and pizza. I like slider sandwiches. Hubz is a hot wing lover. Love chicken wings and curly fries! We don't have a Super Bowl party, but I do love nachos. Probably I would have to pick pizza. Pigs in a blanket is my favorite. Little smokies wrapped in crescent rolls. Definitely chicken wings, chips and dip, sandwiches, pizza, and veggie platter! SPINICH DIP AND WINGS !!! What is your favorite food on your SuperBowl party or game day menu? Hamburger Cheese Dip & Chips is our favorite. we like pizza and nachos. favorite food on our SuperBowl party or game day menu is hamburgers. We like to make chili, fries, and Nacho so we can each make up our own creations. Chili fries with Nacho cheese over the top is my favorite. Yummy. My favorite food for the Super Bowl is hot wings! Thanks! We love doing "Make-Your-Own-Subs" and laying out tons of meats,cheeses,breads, and condiments and letting guests go at it! I love all the different dips! My family really likes little smoked sausages in bbq sauce and lots of dips. Any type of chips and dip, but I love spinach artichoke dip. taco dip and boneless wings. We always make nachos and everyone loves them. I like the classic on game day. I like a nice pineapple and tomato pizza. Wings served with various sauces and dips are my favorite things. Lots of different finger foods and dips and chips. My favorite is Velveeta Cheese Dip! I love a good taco dip on superbowl sunday! Always a favorite is hot buffalo wings and Maryland crab dip. Cheesy Hot Sausage Dip Is My Favorite! I'm all over potato chips. I love tortilla chips and sausage dip! 7 layered dip and chips! 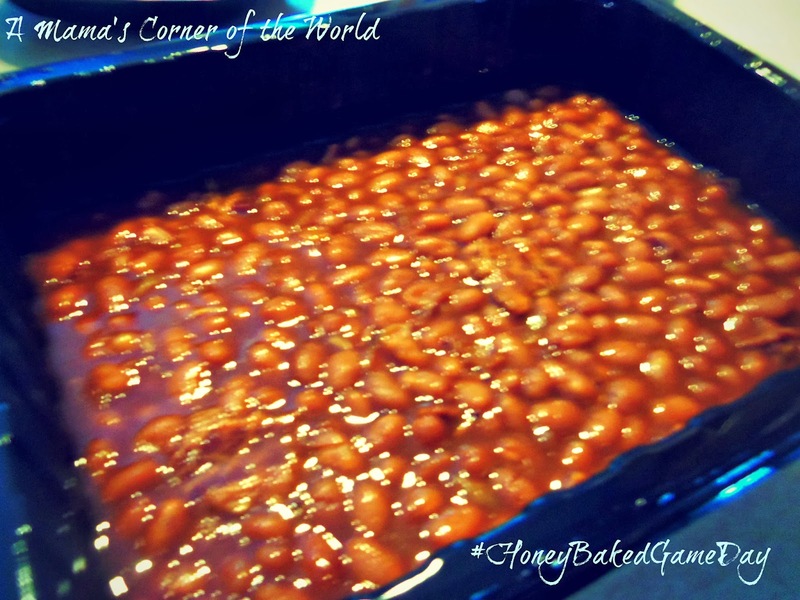 I love my father in laws spicy baked beans!! I love baked potato and cheese. My hubby always makes wings and they are delicious! Oh we love having a sandwich bar with lots of chips and dips! I love to go with Cheesecake! My favorite is spinach dip with tortilla chips! My favorite game day food is lemon pepper wings. My favorite foods for Super Bowl days are sandwiches, Chicken Wings, Veggies with Ranch Dressing. Our favorite is hot wings! But we also always have to have a huge sub sandwich to make the game complete! Pizzawings, veggies, i love it all! I love my mom's cornbread dressing! My favorite is totally the hot wings! my favorite super bowl party food is nachos. I love my taco soup recipe. It is fast and easy and it feeds a ton of people!! I love to get honey BBQ chicken wings. taco dip is my fav! My favorite game day foods are cheese ball and meatballs. Shredded chicken sandwichs are easy and good too. My favorite for game day is pizza! My favorite is seven layer dip with tortillas. My favorite item is Pizza. Chicken buffalo dip is my favorite ! Yum ! My favorite would be the pizza bites or the chicken nuggets. Got to have some Pizza Rolls and Sweet and Sour Meatballs! I would have to say wings and subs! hot wings all the way! We have veggies & dips, cheese & crackers, and pizza. I like the chips and dip! Pizza and wings! Oh and of course Chips and salsa! I like hot chicken wings on game day! Chips and guacamole is my favorite. We love Rotel Velveeta Cheese dip and pizza dip. Pizza, it is a classic. Chips and guacamole is always a fave. My favorite Super Bowl food is chicken wings.